Washington state’s first female firefighter has died. Retired Bellevue Fire Department Captain Jeanette Woldseth passed away in February from complications due to cancer. She was 64. Woldseth first became a volunteer firefighter in Bellevue, but she had her sights on becoming a full-time firefighter with the department. 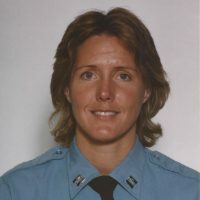 In 1977, Bellevue hired the then-23-year-old, who became the first paid female firefighter in the state. Woldseth was promoted to lieutenant in 1981 and then captain in 1985. She retired in 2002.